I checked out their web site. Fancy-looking. 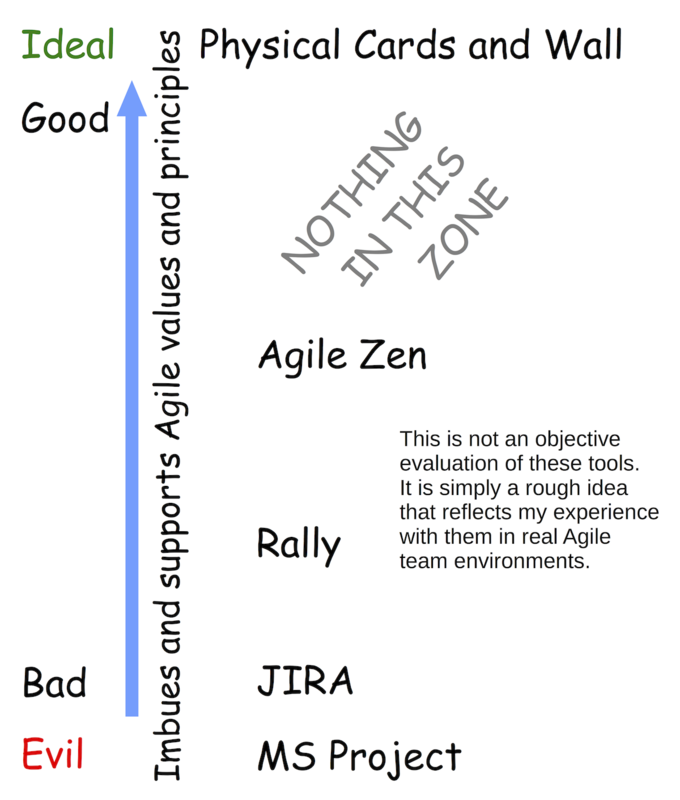 I suspect I would categorize it somewhere between Agile Zen and the full Rally product. Interestingly, their lower price-tier versions may actually be better. For example, fewer reports, limited APIs. Have you used it? If so, I would be interested to hear your analysis. Mishkin, simplicity sometimes masks naivety. Attractive header, poor content, neglecting team setups other than a single co-located team only working during office hours. Why you would even consider MS Project, and do no proper review of supportive tools used at actual teams. Are overlapping cards really readable and ideal? While I can see value in some of your points, simply bashing all alternatives isn’t smart. Am I right seeing a day to day planning in your picture? I assume your are critiquing my article. I know that it is, at this point, still very shallow. I haven’t really said much about “why?” I think these are good features for an electronic tool. I believe that a co-located single team should never use an electronic tool. So, in fact, the existence of this article is all about me considering distributed and multiple team situations. I mentioned MS Project because I have heard of enough cases of PM’s trying to use it to manage Agile teams and because someone put enough thought into its use to produce a 1-hour tutorial video on using it for Agile. As for other tools, I hope to get to reviewing many of them, but I would like to focus on those that might actually be good… And I don’t know if any. 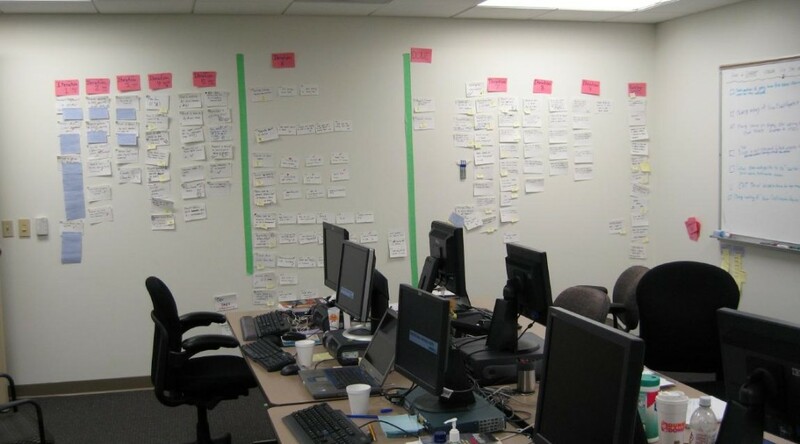 The picture illustrates a team using its wall area for complete Agile planning and work status including work done in past iterations, the current iteration, planned future iterations and current quality issues. I know you hate JIRA, but check this out: http://www.wallsync.net — it lets you print cards and stick them to a wall. Each card has a QR code on it. You take a photo of your wall, and it syncs and re-syncs your wall with JIRA. That looks super cool!!! Thanks for sharing! Are you using it yourself or involved in development of wallsync? If so, I would love to hear more about it from you… maybe even a guest article? Derek.. this look very cool!! Thanks for sharing.. keen to explore this one!! JIRA (actually is the JIRA Agile add-on) has a lot of limitations. I would like to hear what specific things the author don’t like. Thanks. Target Process is pretty darn good. Can you say more about how it stacks up to the list? Or is it good in some other ways? Sorry for the late response. I didn’t see your comment. I’ve tried many such tools, Jira, Rally, Version One, Mingle but I keep coming back to Target Process. You get so much functionality and flexibility for your ‘buck’ and they listen and adapt the product. I have used TP on so many different types of project now, not just Dev IT.. marketing, helpdesks, construction projects..as it’s so customizable it will fit into so many areas with a low learning curve. The graphical, intuitive nature of the UI makes it so easy to navigate and find items. Give it a try and get TP to show you how to get started. It won’t be wasted time believe me. We just started using JIRA. We use it primarily for backlog management and for that purpose at least we like it better than Excel and Trello (our previous “solutions”). We use a physical board for tracking stories and tasks during the sprint as well as a physical burn down chart. I’m surprised with the JIRA hate. Is your beef with the tool itself or how it is used in most organizations? Hi René. Please don’t misunderstand: I don’t “hate” JIRA. I just think it is the worst possible choice for an electronic Agile tool. If anything, I “hate” MS Project when it is used to manage Agile teams. As you have described, JIRA used for backlog management is not quite as bad: you can still do physical tasks etc. for your team, and this is a very reasonable mix of electronic and physical. But even with it used for backlog management, there are still many things about JIRA (and other electronic tools) that leave a lot to be desired. For the use that you are putting it to, how many of the ideal features that I list does JIRA have? I would guess that it is just one or two, and at the same time it is breaking some important ones. For example: how much information are you storing in each backlog item? If it’s more than a couple sentences, then it is a mis-use of the tool… and that mis-use is enabled and even encouraged by the tool. So, indeed my concern is with how electronic tools are used in most organizations… and that mis-use is most often enabled and encouraged by the tool itself. We are using Agilefant. Stories are easy to drag-n-drop from one iteration into another and you can easily see your work queue. Overall for that price I think it works fine. They seem to have a Trello plug-in also, so it would be interesting to read a review how that works. 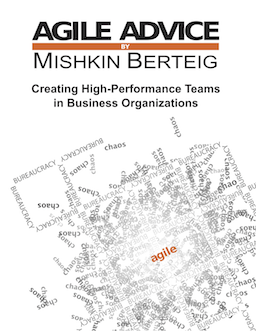 Just finished reading this article to find a better solution other than JIRA, but one mentioned in the article “Agile Zen” is no longer taking new customers… Just informational purposes. We are using Proggio. Great for agile. Anyway, love reading the article. Thanks.